Hi again! I'm so excited to start sharing some Valentine's cards. This first one was fun to make, I used the Be Mine Stitched Framelits Dies from the just released Occasions Catalog. 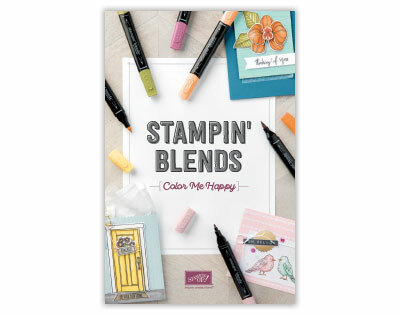 It's available with a coordinating stamp set in the Meant to Be Bundle giving you a 10% discount. Arrange the 3 heart borders to be as close together without overlapping (I used a post-it-note along the two sides to hold them in place. 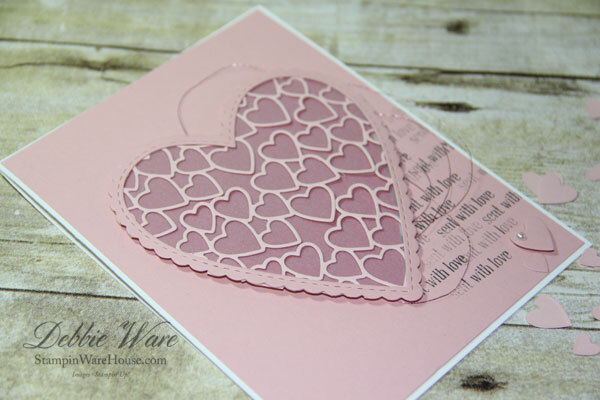 Apply Mono Adhesive to the scalloped heart and lay it over the heart borders then carefully trim away the hearts that hang over. Glue the Vellum heart the to back then place the Lovely Lipstick Heart behind those layers using Dimensionals to hold it in place. Using Basic Gray Ink I stamped repeatedly the "sent with love" phrase from Itty Bitty Greetings, sometimes stamping without reinking. Loop some Rose Metallic Thread and attach with a Glue Dot then place the heart. I added a couple little hearts in the bottom corner, putting a tiny Basic Pearl Jewel on the larger heart. It was a fun card to make! All of these supplies can be purchased through my online store. 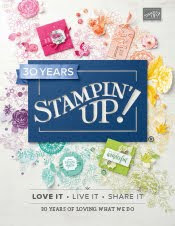 I'd love to be your source for your Stampin' Up! supplies. 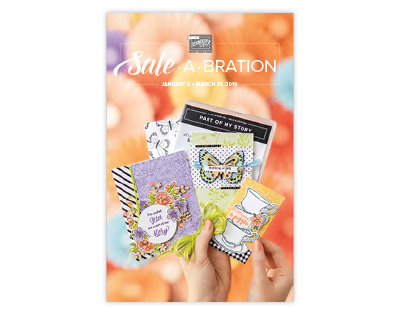 It's Sale-a-bration time which means that for eery $50 in product you get to choose a free set from the Sale-a-bration Catalog. Be sure to use my January Host code QFU7KRX7 (when prompted online) if your order is under $150. 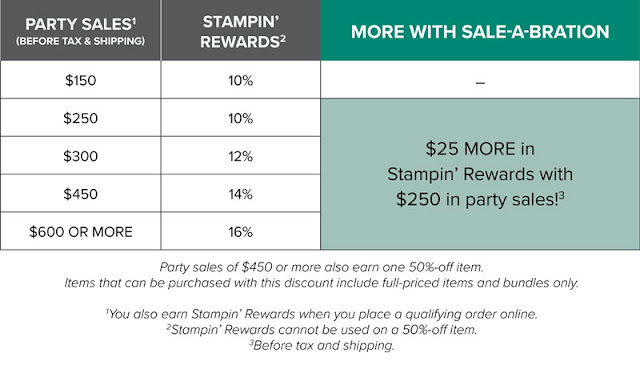 If your order is $150 you get Host Benefits! Happy New Year! 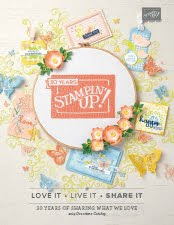 I've got a card to share with you today, but before I get to that I want to let you know that the new Stampin' Up! 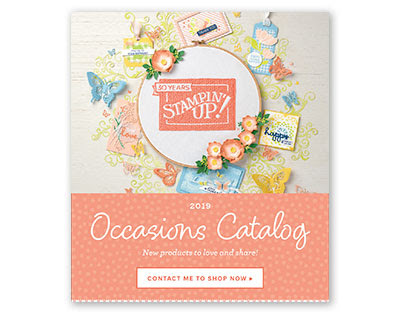 Occasions Catalog and Sale-a-bration launch tomorrow. I can show you these covers but I have to wait until tomorrow to link to the contents. 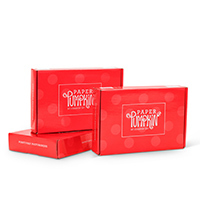 Option 1 you get $175 in product (your choice) for just $99 with free shipping. Wow! So much happening today and tomorrow. Here is a card for your to enjoy while you are making your wishlist! 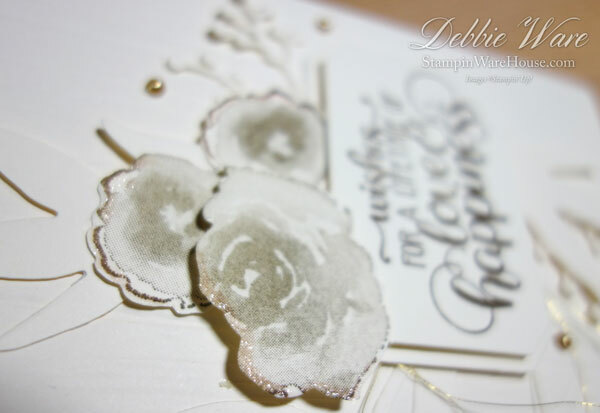 I used the First Frost stamp set and the Frosted Bouquet Framelits. I'm excited that this Holiday Catalog item will be carried over. But, if you want the Bundle saving of 10% you need to order today. This is a very neutral card and I'm using it for a wedding shower I'm attending. I started with aVery Vanilla Thick card stock base. Used the Pinewood Planks embossing folder to emboss a Very Vanilla layer and added that you yet another Very Vanilla layer. I stamped the flower images in Soft Suede on scraps of Very Vanilla paper and used the Frosted Bouquet Framelits dies to cut them out. Did you notice that there are two identical dies for the smaller flower? One pass through my Big Shot and the cutting is done! The leaves and springs and the label were also cut from the Framelits. I added some gold Metallic Pearls and some loops of Gold Metallic Thread. 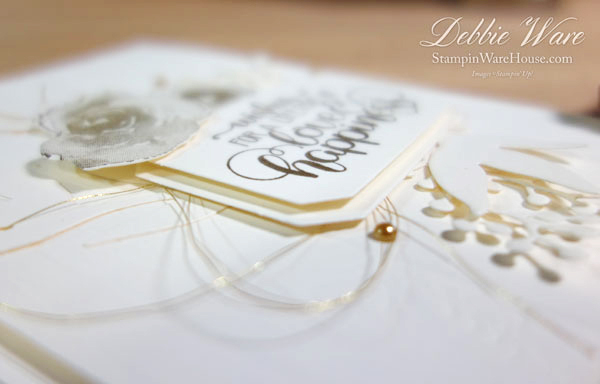 The greeting is from the Dandelion Wishes stamp set and was stamped with Soft Suede ink. After taking most of the photos I decided to add a touch of Wink of Stella to the edges of the flowers. I love how when added to Soft Suede it takes on a antique coppery look. I hope you enjoy this card! 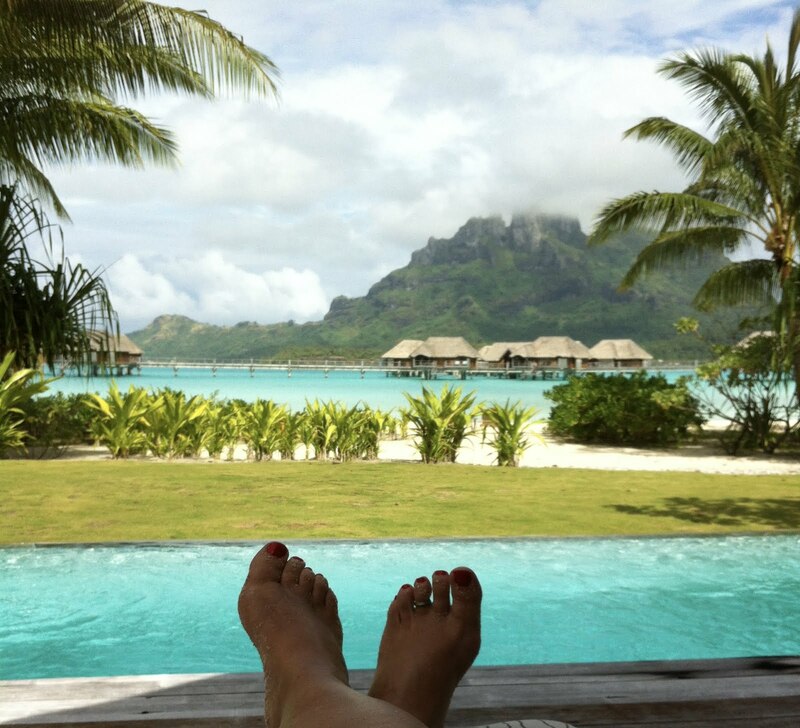 I love to read your comments. All the products for this card can be purchased on my online store. Be sure to use my January Host code QFU7KRX7 (when prompted online) if your order is under $150. 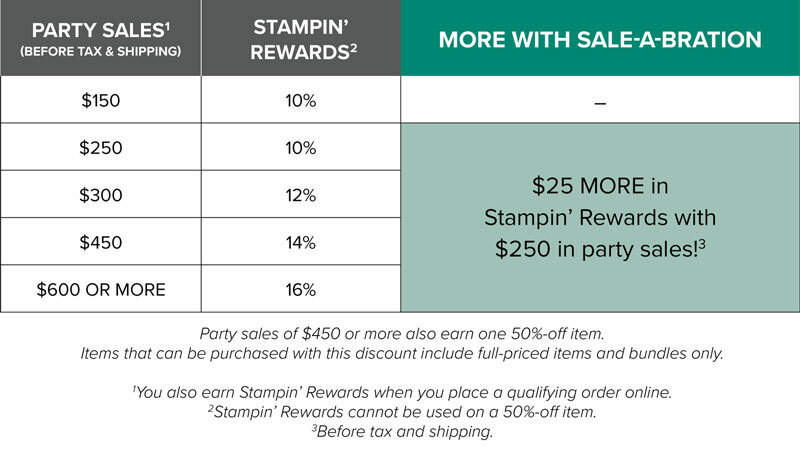 If your order is $150 you get Host Benefits! 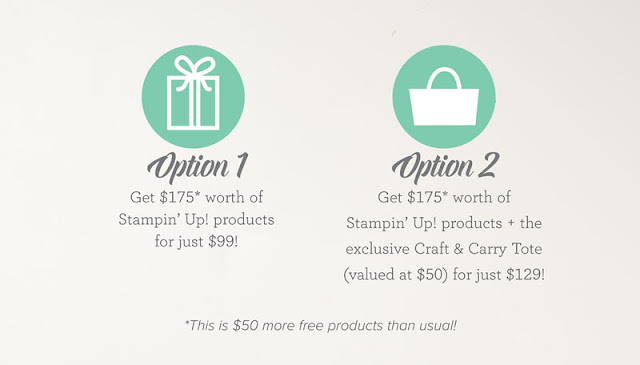 I'd love to be your source for Stampin' Up! products. Be sure to check out items retiring today and the Clearance Rack.